When we moved into our new home, it became quickly apparent that our existing cushion covers weren’t going to cut it in our new lounge. The silk covers I bought from a market in Chiang Mai had toned in beautifully with our old lounge walls, but they didn’t look right once we’d moved everything in to the new place. I contacted Emma, of Rudi by Em; she makes gorgeous cushion covers when she has a moment to spare (she has three lovely kiddies (aged three-and-a-half, almost-two, and four-months old), as well as a menagerie of animals and a wicked vegetable garden the size of a small nation, so I’m in awe as to when that is!). Amongst her fabric samples, I spied a lovely teal spot that I thought would work beautifully with our sage-mint-teal walls, and a coral chevron that I adored. We sent a few messages back and forth, discussing ideas, backing colours, pairings…I knew Em would have a good eye for what would work and what wouldn’t, and I was happy to trust her judgement. All I knew was that even though I loved the chevron, it could date pretty fast, and I didn’t think my husband could handle four of them! I love the covers so much – I never thought it possible to love furnishings, but I smile each time I snuggle up on our couch. The combination of colours and patterns (both backed in a simple-yet-effective black) looks great, and they are beautifully made. The chevron fabric is quite thick and rather tactile; the spot fabric is thinner but delightfully soft. Em is happy to do custom orders, so if you’re after something specific, she’ll be more than happy to discuss your ideas with you. Here comes the best part: I’ve teamed up with Rudi by Em to give one of YOU a cushion cover! There are three to choose from (pictured below), and having seen them all in real life, I know you’ll have trouble choosing your favourite. To enter, simply visit Rudi by Em on Facebook or Felt, and leave a comment on this post telling me which is your favourite of her fabric options. Please leave a separate comment for each entry (with links where applicable). Giveaway will close on Friday 25 October 2013 @ 5pm (NZ time) and is open internationally. The winner’s name will be drawn from a hat by one of my grubby-handed boys; please ensure your email is linked to your name, or include it in your comment, so I can get in touch if you are the lucky winner. The opinions expressed here are my own; no payment was made for this review. This entry was posted in Competitions, Giveaways, Product Review by Ange - Tall, Short, Tiny & a Pickle. Bookmark the permalink. Love the Purple Chevron! 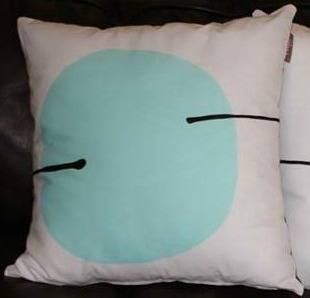 In need of some cushions for my lounge and these look gorg! I’d choose the purple chevron; purple is my ‘happy colour’ 🙂 It’d be for my bedroom. Her yellows (chevron and butterflies) would be ideal for my living room with its dark brown, too. Her chicken cushion is awesome! In my head I was like “that is so crazy” and then I was like “i love it.” hahah! If I won, I think i’d choose the purple chev! Oh and I follow your new fb page! GREAT to do that btw!!! Of the fabric options on felt, I like the Yellow and White Link cushion the best. Great giveaway, Ange! I love the purple chevron! Great giveaway! !